The architecture in Rotterdam is definitely one of the aspects that makes our city so unique. The bombing in 1940 destroyed large parts of the center. Even though this was devastating, the locals immediately got to work and started to rebuild the city. During this reconstruction, big architects with different styles helped and created a diverse city scape. Now, Rotterdam has various modern buildings that are quite unique. Therefore, a visit to Rotterdam definitely has to include exploring some unique architecture. 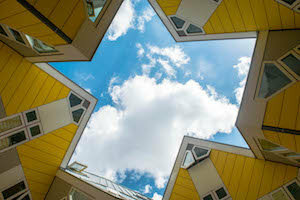 With this architecture route in Rotterdam you can explore some of the best masterpieces in the city. How to get around? 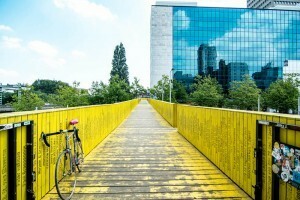 We recommend going on a bicycle, as this is a convenient and fun way to explore this architecture route in Rotterdam. Not a fan of bicycles? Of course it’s also possible to get around by public transport; all parts of the city are very well-connected. You can also walk, but then you have to make sure you wear your walking shoes. Blaak is a good starting point for architectural enthusiasts, as here you can immediately find some of the most iconic buildings. 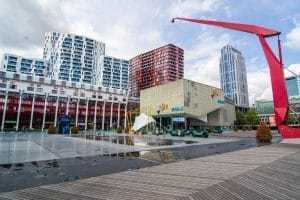 At Blaak you will find the Markthal, Rotterdam Library, the Cube Houses and the Blaak Tower, also known as “The Pencil”. It’s possible to take a look inside one of the Cube Houses for €2.50. Make sure to also check out the Blaak Station and historical building Laurens Church, as they are both worth visiting. The Markthal is also the perfect place to get some food, because there are plenty of food stands with various options. Bring your appetite and grab a delicious and healthy breakfast at the start of your architecture tour! It’s really a nice bike ride from Blaak to The Erasmus Bridge. If you are not by bike, you can also go there by public transport. We recommend walking to Beurs and take the metro to Leuvenhaven. This only takes about 10 minutes. From Blaak you can cycle over the boulevard (better known as the Boompjes) towards the Erasmus bridge. 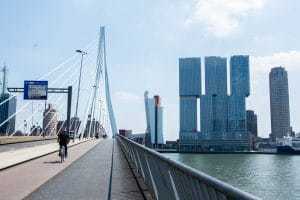 From there you have a beautiful view of the Rotterdam skyline before you arrive at the Erasmus Bridge. Here you will find several beautiful modern buildings such as the Rotterdam and Hotel New York. We also recommend crossing the bridge and explore the the Kop van Zuid, if you have time. You can cross the bridge by foot, bike or with public transport. A 15 minute bike ride brings you to the Euromast. It’s a bit out of your route, but you just can’t miss it. 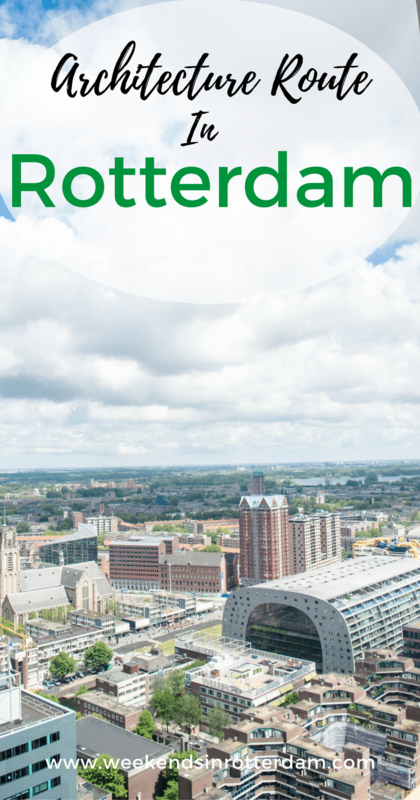 Not only is it one of the components of the Rotterdam Skyline, it is also the ideal place to admire Rotterdam from above. To get to the top you can go in the Euroscope, in which you’ll learn more about Rotterdam via a voice-over. In the Euromast you will also find a restaurant, where you can have dinner or a drink. Are you really in for a unique experience? 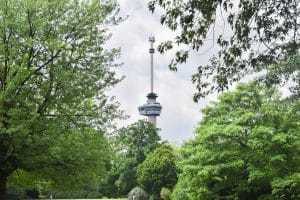 You can also spend the night in the Euromast. Food & drinks: Markthal, Bagels & Beans, Happy Italy, Vapiano, Little V, Very Italian Pizza, The Fish Market, Humphrey’s. Food & drinks: Hotel New York, Prachtig Rotterdam, Nhow Hotel, Café Rotterdam, Las Palmas, Restaurant Wereld Museum, Zee Zout, Bar & Brasserie Water. Food & drinks: Euromast restaurant, Pannenkoekenboot, Parqiet, Restaurant Parkheuvel. After admiring the Skyline and the iconic Erasmus bridge, we continue to the Museum Park. It’s possible to get there with the public transport or by bike, which will only take you approximately 5 minutes. Once you arrive, you can go to a museum and visit one of the well established museums such as Boijmans van Beuningen, but Museumpark is also a good place to see some architectural works. In addition to Boijmans van Beuningen you have the Arminius church, Het Sonneveldhuis and The New Institute Museum. By this time you’ll probably be a bit hungry. Luckily, the terrace of the Nieuwe Instituut Museum, called The New Café, is an excellent choice, especially when the sun shines. If you’re into art, be sure to check out our Art Route in Rotterdam. 3012 CL Rotterdam | Bus and tram: Weena or Kruisplein. Metro: Station Stadhuis. From Museumpark it’s only a 4 minute bike ride to Schouwburgplein. Perhaps you’re in need of some entertainment? Find it at one of the venues at the iconic square Schouwburgplein. In the meantime, you can also admire some more modern architecture. Not only are there entertainment venues such as the Pathé, Schouwburg and De Doelen, here you can also find the iconic red “cranes” that the visitors can control. Each day Schouwburgplein looks different, as there is custom furniture that they move around. Over the parking lot the surface is raised up, and it is often used for different festivals and installations. Stationsplein 2, 3013 AJ Rotterdam | Bus, metro, tram and train: Station Rotterdam Centraal. From Schouwburg you can reach Rotterdam Centraal Station within a few minutes. This is not just any Central Station, because the building itself is an iconic gem of the city. It is one of the most important transport hubs in the Netherlands with 110,000 passengers a day. Not only trains, but also trams, buses and the metro come here. But besides that it’s a place to travel, it’s also a beautiful modern building to admire. The station’s entrance is made of stainless steel, and part of the hall is made of glass and wood. The style of the station fits exactly with that of an urban landscape. Food & drinks: The New Café, Espressobar Boijmans, l’Entrecôte. Food & drinks: The Doelen, The Pepper Trail, Pho Vietnamese Restaurant & Noodle Bar, Dionysos, Steak & Beer, Dino’s Cafe Steakhouse, Sumo. Food & drinks: Lebkov & Sons, Trattoria A Proposito, Vapiano, The Manhattan Brasserie & Bar, Stations Huiskamer, The Suicide Club, Nationale Nederlanden Douwe Egberts Café. After the central station, we recommend visiting the photogenic Luchtsingel, which is within walking distance. The Luchtsingel is a wooden pedestrian bridge of 390 meters and connects Rotterdam North with the center of Rotterdam. 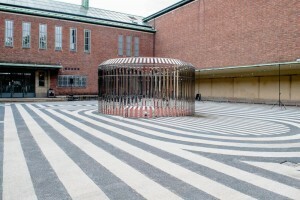 This initiative has revived an area that was no longer in use. It’s an area that is amazing to walk around and take photos. There are various cool colourful walls and other artworks in this area too, such as under the Hofbogen. It’s a great location to take some colourful photos! Food/drinks: Bar Rotterdam, Annabel, Op Het Dak. A beautiful route to fill your day with architecture. Of course, you can also start halfway through the route, walk it from back to front, or cut it up in parts. And if you cannot find a street, feel free to ask people around you. A true Rotterdammer knows exactly where it is! For your ease we have also included a map below. Hi, very informative article. I want to visit Rotterdam someday and after reading this, I got a totally new perspective of the city. Thanks for sharing.